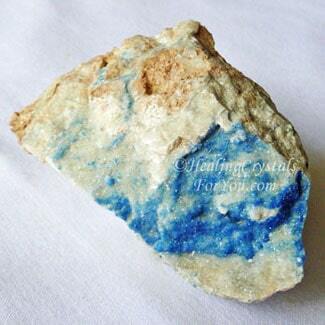 Kinoite has an energy can be felt within all of the higher chakras, but especially at the throat and third eye as well as the higher heart chakra, the seat of loving compassion in the body. Its vibration boosts psychic communication while in meditation, and it may assist you to easily recall ideas communicated to you by Source during meditation. They are beneficial healing crystals for you to have in your life as they are good healing stones, with a number of useful properties such as helping stress, improving sleep and some other health issues. 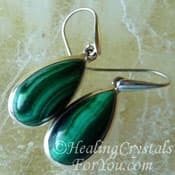 They have a quite spiritual energy that is helpful to aid you to release issues that may be holding back your spiritual growth. 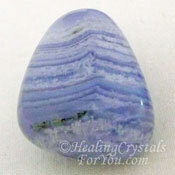 They resonate within the throat chakra to aid honesty and clarity in your communication, and one of its more desirable stone properties relate to its action to truthfully relate what was told to you. The meaning of the name of this mineral comes from it being named for Eusebio Francisco Kino, who was a Jesuit explorer, pioneer and missionary in the Californian region. It is not a common stone and is only found in only a couple of locations, including in Michigan, and in the well known Christmas mine in Arizona USA. It is an uncommon stone which either has a monoclinic crystal system, or it may appear as a light coating on other rocks. 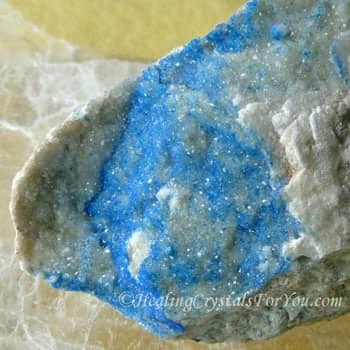 It often occurs as a deep blue crystalline coating or crust that forms on other rocks, often in the cracks in the stone. 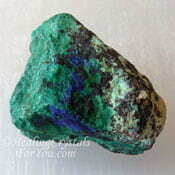 It is a copper silicate mineral that commonly occurs in combination with other crystals, including with Apophyllite, Bornite also called Peacock Ore, Chalcopyrite, Calcite, Copper, Wollastonite and Dioptase. Why Would You Use Kinoite? 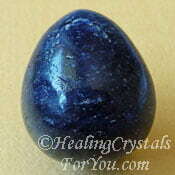 This blue mineral embodies a deep compassionate energy, as it resonates strongly within the higher heart chakra. The higher heart chakra is the area that strongly relates to the energy of Divine love, compassion, truth and forgiveness. As this is also the chakra that relates to the origin of language, having the vibration of this stone resonating within that area will assist you to speak from the heart. It's vibration will help you to feel more loving and compassionate, both to those surrounding you as well as towards yourself. 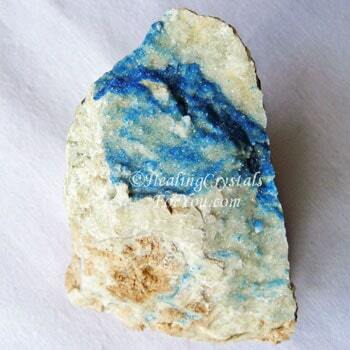 The metaphysical properties of this stone will aid those who are on the spiritual path and who wish to lift your proficiency in spiritual matters. This energy may help you to release any perceived shortcomings that you feel may be holding you back on your spiritual journey. By changing how you look at things, this may help you to gain awareness of areas where the practical use of compassion could be used to assist others. This may help you to have a more loving and compassionate outlook in all areas of your life, and is said to stimulate an interest in humanitarian projects. 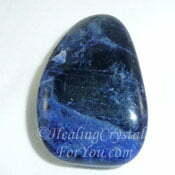 Using this blue stone in meditation may help you to bring a higher perspective to your spiritual life. 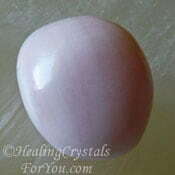 It is a good stone to stimulate psychic gifts, and may particularly assist you to strengthen your ability to communicate with Spirit and with beings in the spiritual dimensions. It may aid with the channeling of information from the higher realms, and may improve your ability to quietly verbalize what you have learned to others on your return from meditation. 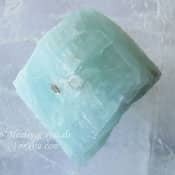 The energy of this crystal may assist you be more aware of the energy of truth within your communication with others, and helps to release anything that encourages deceptive concepts or ideas. 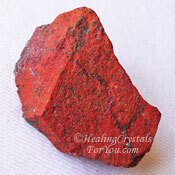 Because this stones vibration may help you to gain an awareness of the way you are communicating, it may aid you to discover if you may be limiting the flow of ideas received from source or restricting the easy exchange of ideas with others. This may assist you to communicate higher truth received from Spirit, and avoid errors and any type of deception in your exchange of information with others. 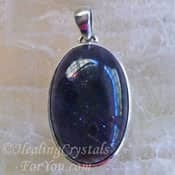 This stone has a number of useful healing properties including helping to remove energy blockages that may be causing health concerns. 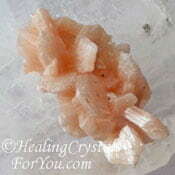 It has a lovely soothing and calming energy, and is a good crystal to help you to sleep better. For this purpose have two stones, and place one at the head and the other at the foot of your bed. 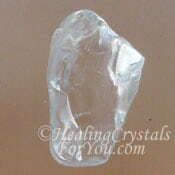 This crystal is said to aid healers to gain clarity through having a greater awareness of issues within the body that are not easily seen externally. 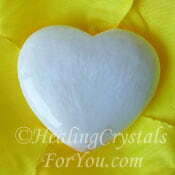 It said to assist healers to more clearly see what is occurring internally, including within the physical, emotional, mental and spiritual levels. It is said to have a good action to assist problems within the throat, such as issues in the larynx, in the tonsils and adenoids. It is said to help the nerves and the teeth and to help sinus problems. It is also known to help to relieve stress and to boost your energy, and may aid bone and muscle problems. "People will forget what you said, people will forget what you did, but people will never forget how you made them feel. " Maya Angelou. 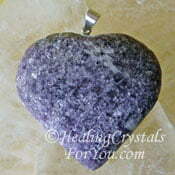 This is a strong stone to help to relieve stress or tension you might be feeling. 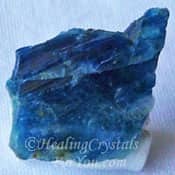 There are a number of excellent crystals for relieving stress, and many of these will be helpful to lift your spirits if you are feeling down-hearted. There are many stones that may help with the release of tension and stress, and there are quite a few crystals shown in my article on ways to relieve stress, so check them out. Specific stones that you may like to use with it includes Polychrome Jasper, Lilac Lepidolite, Aquamarine or Mangano Calcite. 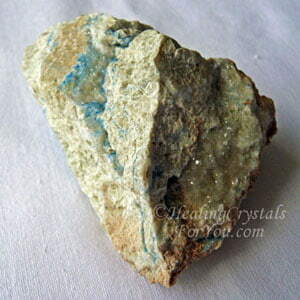 If you have insomnia or have been having trouble sleeping even occasionally, you may choose to combine this stone with other crystals to help you sleep. 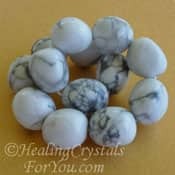 Some beneficial stones that are helpful for sleep include the lovely white Scolecite, Lilac Lepidolite, Stilbite or Howlite, as well as a number of other crystals you can read about in the article on stones that aid sleep. 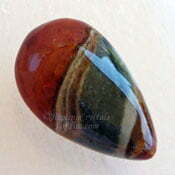 If you feel that you'd like to strengthen the energy of truth that this stone vibrates with, there are other stones that also stimulate truthful communication. 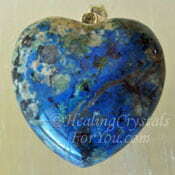 Stones for this purpose include Blue Sodalite, Amazonite, Goshenite or Turquoise. 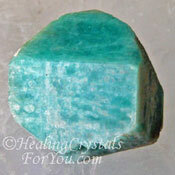 To stimulate your ability to communicate with Spirit, combine this crystal with other stones that also aid psychic communication. 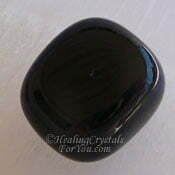 Stones for this purpose include Lapis Lazuli, Black Obsidian or Iolite, but do read the page listed above (on this subject) where there are many more stones mentioned. 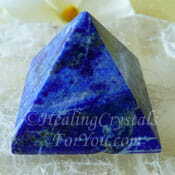 Many of the throat chakra stones will also benefit by being used with these crystals, including Azurite, Lapis Lazuli, Blue Lace Agate, Blue Sapphire or Blue Euclase. You may like to use it with other copper based stones. It does not have the depth of energy that many copper based stones doe, so using them in combination may help to punch up the energy. 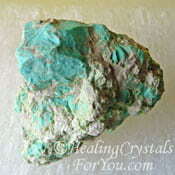 Other copper based stones you may like to combine it with includes Malachite, Shattuckite, Azurite, Cuprite or Eilat Stone.